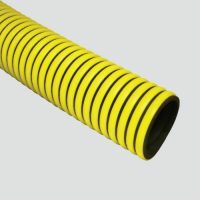 A lightweight, flexible, rugged suction/discharge hose which has good chemical resistance and is excellent for transferring fertilizer solutions, septic solutions, pesticides, and is Lasso® resistant. Its corrugated polyethylene helix serves as a scuff strip, making it durable and easy to handle. 50′ and 100′ lengths are standard. Other lengths available upon request. Warnings: Manufacturer testing completed at 68°F for PSI and minimum bend radius. Increase or decrease in temperature may affect hose performance.